Diet aptitude meets stylish attitude in this book for hip women who want to feel great, look sensational, and do it on their own terms. Forget the rice cakes and cottage cheese, the nutrition gimmicks that promise and don't deliver, the food enforcers who want to starve us into shape. 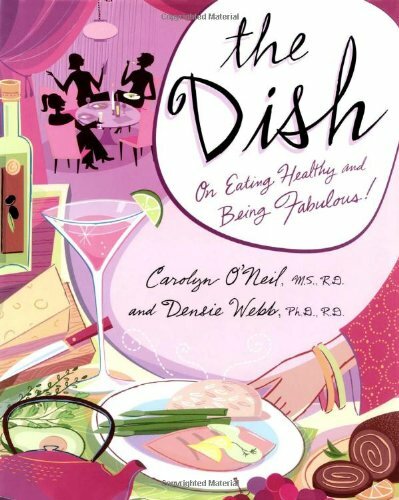 Carolyn O'Neil and Denise Webb may be registered dietitians, but don't call them nutritionists--they're dish divas, come to put the joy back into eating right and feeling good. The Dish shows readers how to achieve three principle goals: to fit healthy eating into their hectic lives; to make healthy eating as stylish as they are; and to be healthy by eating more, not less (it can be done!). Carolyn and Denise are as fun as they are knowledgeable, and their revolutionary ideas are written in an intimate tone that will keep readers turning pages for more juicy information. In addition to presenting tips on menu choices, staples that every healthy eater should have in her kitchen, and finding the physical activity that works, the authors also dish out plenty of fresh advice on beauty and fashion that can help readers on their quest to streamline their look and their lives. There are sections on cocktails and wine, restaurant menus from four star to fast food, party planning, foods that pack an awesome nutritional punch, and more, including self-tests that help readers gauge their progress. Mixing heaping portions of culinary wisdom and chic insight, The Dish allows women to have their chocolate torte and eat it, too.